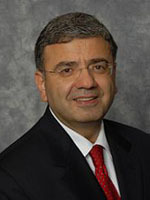 Dr. William Zoghbi, Weill Cornell Medical College professor of medicine and cardiologist at the Methodist DeBakey Heart & Vascular Center, recently took the helm of the world's largest society of cardiologists with a goal of creating and expanding programs that directly help patients. "As our information–based society evolves, and more and more people around the world have access to information, we feel it makes sense to put a new emphasis on patients," said Dr. Zoghbi, the William L. Winters Chair in Cardiac Imaging at the Methodist DeBakey Heart & Vascular Center in Houston, Texas. "We want to make patients part of the decision making, and give them tools to educate themselves." Dr. Zoghbi, the chief of cardiac imaging and the director of the Cardiovascular Imaging Center at The Methodist Hospital, became President of the American College of Cardiology on March 26. Among the new information–based American College of Cardiology (ACC) initiatives are expansions of CardioSmart.org, an ACC website that serves patients and their caregivers, and CardioSource.org, a portal for doctors, nurses, and other health care providers. The ACC will also provide new mobile tools for smart phones and tablets that help users find crucial information — wherever they may be. Patient–Centered Care — In addition to creating new and improving existing information technology tools, Dr. Zoghbi said the ACC will develop "robust news and editorial features" that are patient–friendly. The ACC will also continue to support community–based programs and events (such as the U.S. Dept. of Health & Human Services' Million Hearts™ Campaign), and seek out patient perspectives more actively to improve the delivery of information and health care assistance. Education — Lifelong learning tools will be more easily accessible to members, as well as tools that help doctors and other health care providers meet competency requirements at their hospitals and clinics. The ACC will launch its first–ever annual curriculum planning guides for educators, and a broader array of Internet–based education tools, including events that can be live–streamed on the Web from the point of lecture or procedure. Science and Quality — The ACC supports outcomes–focused studies to reduce inpatient hospital stays and increase patients' well being. The College will provide a knowledge base that will allow cardiologists and health care administrators to compare their own outcomes to the National Cardiovascular Registry Data — and also upload their own research data. Advocacy — The ACC will continue to support efforts to eliminate Medicare's "sustainable growth rate" formula that most physicians, including those representing the American Medical Association and most state medical associations say is hurting the timely and efficient delivery of health care services to older Americans. The ACC will also continue to work with government agencies to propose new payment models that reward quality and outcome over the traditional volume of care. International — About 13 percent of American College of Cardiology members do not live in the United States. These non–U.S. residents are the fastest–growing contingent within the organization, and are expected to outnumber American members within the next few decades. Dr. Zoghbi said that the American College of Cardiology will continue to work with sister entities in other countries to improve heart and vascular health, and look at new ways to engage its international members. "This year, the College will have 20 international chapters — the most we've ever had," Dr. Zoghbi said. "This coming year, we aim to enhance educational engagements between American and international chapters, both through national and international meetings and through our CardioSource and CardioSmart online communities."